The Nursing profession has traditionally been dominated by women, but more men are entering the field year after year as the dynamics of the healthcare industry change. According to a study by the U.S. Census Bureau, male participation in Nursing has tripled since 1970, and analysts predict this trend will continue as more men are encouraged to enter the profession. Because there are a lot of myths and misconceptions about males in Nursing, male Nurses want their patients, employers and colleagues to know more about them. One unfair, but unfortunately popular, myth is that males who go into Nursing do so because they couldn't get into medical school. This myth assumes that men belong as doctors and women belong as Nurses, but this idea is very outdated. Men who go into Nursing do so because they have a passion for medicine and for helping individuals and families in their care. Male Nurses aren't settling. They're doing what they love. Society often views women as being the more compassionate gender, but men who enter the Nursing profession do so because they love to care for patients. Patients, doctors, and other Nurses should know that males who become Nurses are committed to providing the best possible care. Compassion for individuals and families is what Nursing is all about for both males and females. St Camillus de Lellis, also known as the patron saint of Nursing, started the Camillian Order of Health Care Workers. Their big red cross, which would later be recognized as the international symbol for medical care, was worn by Nurses on the 17th century battlefield who attended to the injured. Walt Whitman, one of the most famous American poets, volunteered as a Nurse during the Civil War. In fact, more than 1 out of 3 Nurses in the military are men. While it's true that men's participation in the Nursing profession is higher than ever, they still only represent around 10% of Nurses. 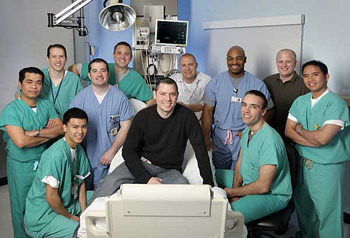 Hospitals and other medical facilities realize that the diversity offered by men can improve the level of care they offer patients, but men often need to be encouraged to enter the field. The more support given to males in the industry, the more attractive the profession will look to potential male Nurses in the future. Males currently make up 13% of nursing school students, but that number could be a lot higher. Whether you're a hospital manager, doctor, patient, or female Nurse, men in Nursing want you to know that their prepared for the challenges of the 21st Century healthcare industry. They're ready to work hard and have a true dedication to quality patient care. The more information people have about male Nurses, the more they will be welcome in a profession that has been traditionally ruled by women. Like this article? You'll love our bi-weekly eNewsletter! Click the icon below!